We've been living in Auckland for nine months now and I've missed having a vegetable garden. There isn't anywhere good to put one that the landlord will approve of, so I've been living without. However, this week I started reading the books Embrace Your Space by Janet Luke and One Magic Square by Lolo Houbein, and they got me thinking about what I can do in the space I have. I had already been growing herbs in pots against the sunny side of our house, so I decided to think bigger in the same space and grow vegetables there too. I went to Kings Plant Barn today to check out what they had and found wooden planter boxes on sale. 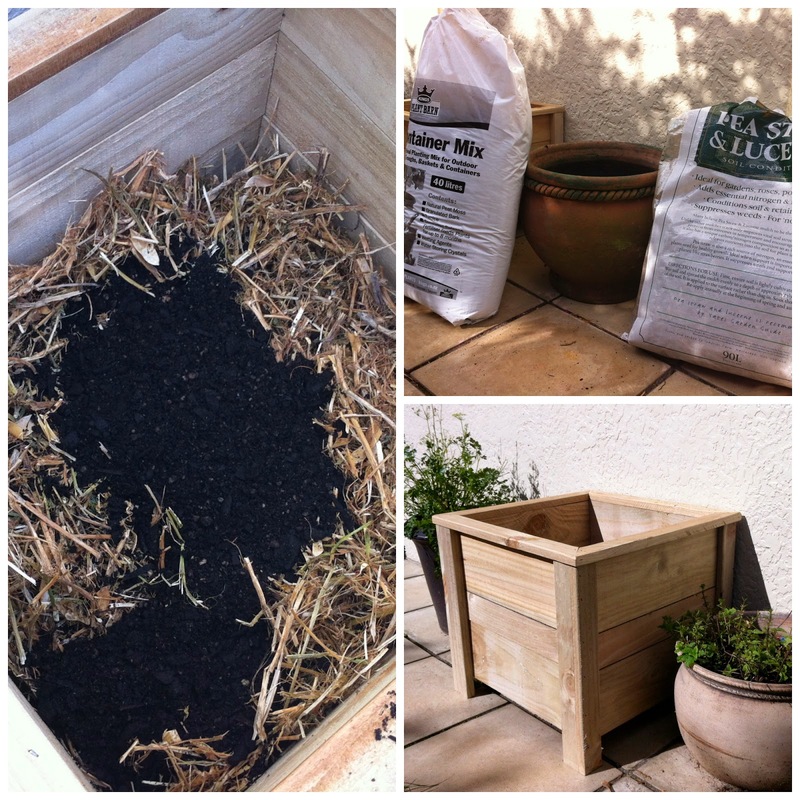 I half filled the planter boxes with Pea & Lucerne Straw to bulk them out without adding too much weight, and then topped them up the rest of the way with Container Mix. Over time the straw will break down, fixing nitrogen into the soil above it. It will also heat up as it decomposes, which will encourage plant growth over the coming winter months. 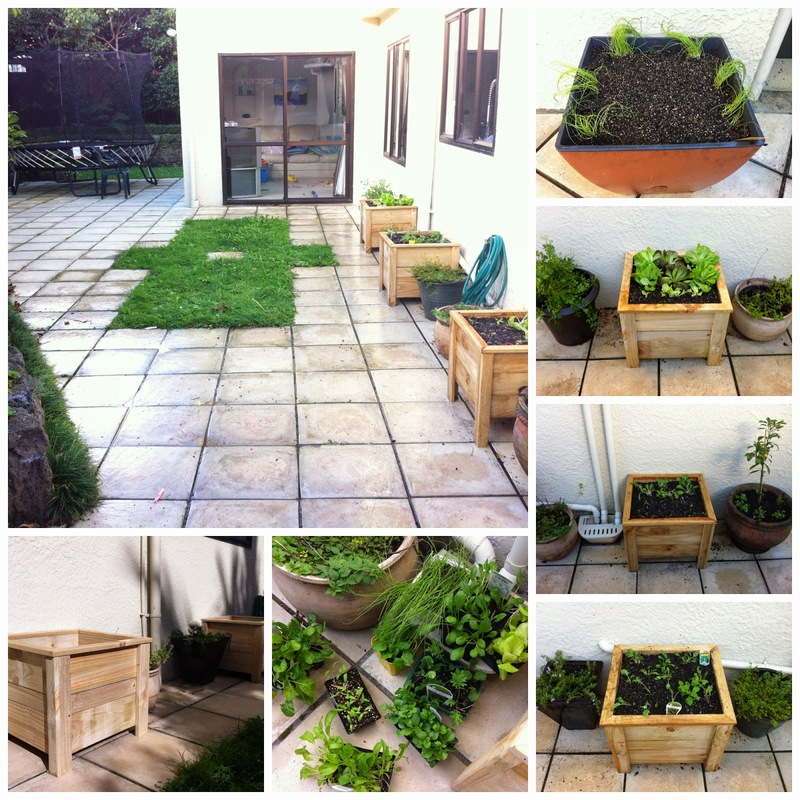 I planted my new boxes with various kinds of lettuce, kale, spinach and silverbeet. Then I reorganised a couple of big pots I already had to make better use of them. I shifted strawberry plants out of one large pot and replaced them with spring onion seedlings and carrot seeds. I've been spending a lot of money on organic carrots from the supermarket, so it's high time I grew my own again. I'm hoping the odour from the spring onions will deter any carrot-loving bugs. I replanted a lime tree I already had into the other large pot, which my mother-in-law recently gave me, because the lime tree wasn't doing well in our shady garden. I planted blue lobelia around it to attract bees for pollination. I have to say, it does my heart good to have these pots and planter boxes full of edible joy. I can't wait till morning when I can go and inspect my new garden again and anticipate my first harvest. Yay Emma! I love magic square, there is a sequel too, which is also great reading. Wonderful to see you gardening again, it was so sad that you had to leave your wgtn garden behind! Ooh, what's the sequel about? I love those wooden planter boxes, it is amazing what one can grow in containers. Hi Emma, I missed you! Began to wonder where you were! I love reading your blog .... interesting, healthy recipes and easy to follow gardening tips. Thanks for your inspiration!